Cleared out started with seven different bottles of assorted soy sauces, four kinds of vinegars, three olive oils, bottles of sherry, Madeira, Marsala wine, and all the “use them all the time spices” taking up the whole right side of the stove top. I cook basically salt free now but out in case salt is needed there is regular salt, Lawry’s seasoning salt, salt in a cute grinder, Himilayan and Dead Sea rock salt with a miniature grater as well as grinder jars of plain black pepper, five color pepper, lemon pepper and white pepper. Hanging above to be removed is my collection of antique copper pots and in the other corner waiting to be carted to card tables in the dining room my blender, Cuisinart, toaster oven, electric tea pot, coffee grinder for golden flax, big bag of dog food, bowls of lemons, limes, and bananas. Potassium you know, bananas that is. And tucked in very back a brown paper bag with avocados ripening in it. On the shelf over the sink there is the cute wooden mushroom shaped thing and round of wood I use for crushing garlic, a bunch of lemons ripening, pomegranites my neighbors brought from their ranch and a 10 year old jar of honey in case of burns. The fire extinguisher is on the floor but leaning against a wall to be painted so that has to be schlepped into the dining room as well. 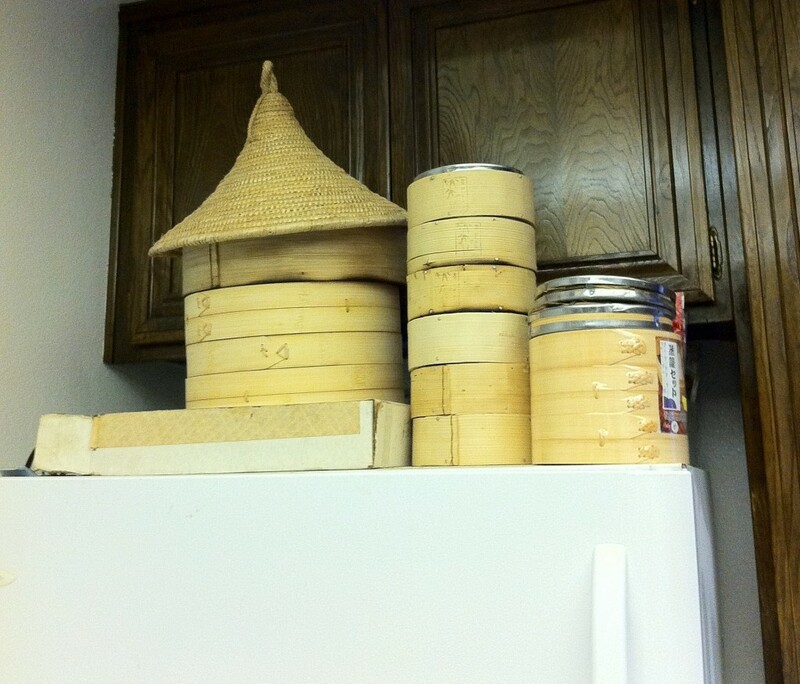 And can’t forget the items on top of the refrigerator — Chinese bamboo steamers and lids of every size from 4″ diameter to 14″ with one lid you wouldn’t believe. Customs insisted it was a hat as I came through on one trip en route home from remote parts of China. 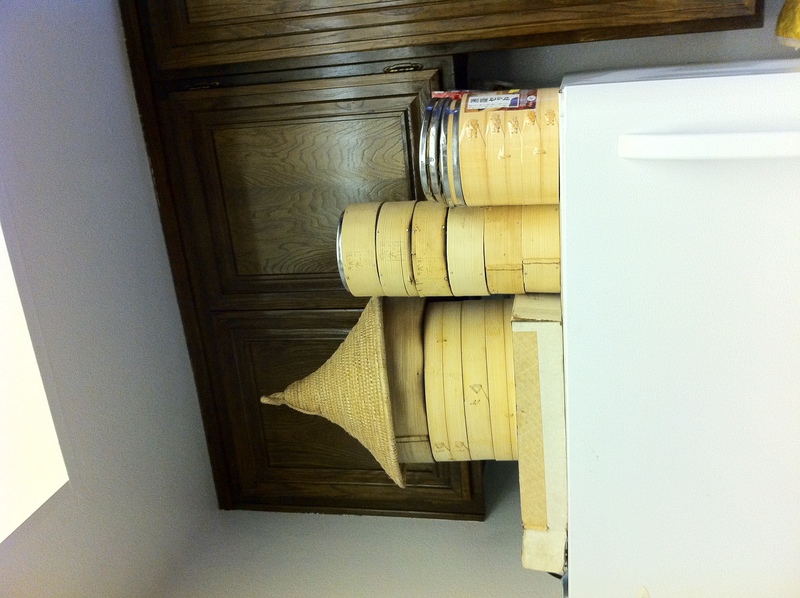 “It’s a lid for my bamboo steamer!” I’d argued. They listed it as a taxable hat. But this was just the beginning. The book shelves of cook books lay waiting. Two shelves of Chinese, one shelf each for Italian, French, and “assorted countries” — not sure Charlie Trotter would like his five very good cook books thrown into other assorted countries but then Charlie isn’t French, Italian or Chinese now is he. But its the very top shelf that got to me — first with an allergy attack because dust had been gathering up there for at least 30 years. The other way it got to me was what was there, mainly sort of ancient pamphlets and booklets given out by various companies with recipes. You know, Jello Company on how to make 20 kinds of fruit jello molds. 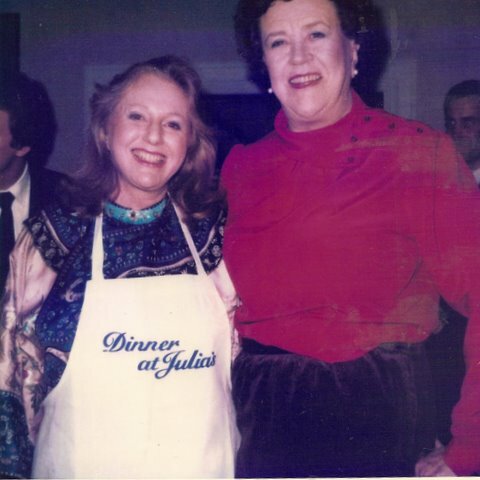 I realized that pre-Julia Child we actually used those things. 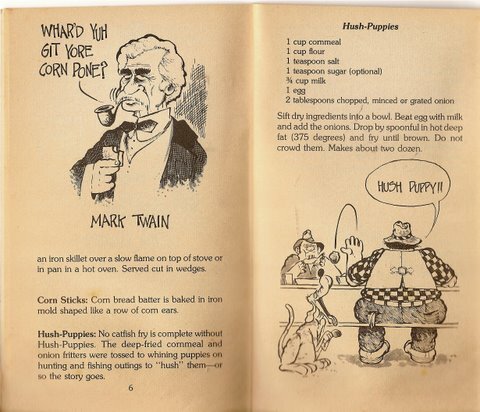 True Grits by Rosa Tusa and Sam C. Rawls is a book for “Yankees who don’t know a ‘Limping Susan’ from a ‘Hopping John’, and for Southerners too, who always wanted to know but were afraid to ask.” I wanted to know how to make a Hopping John? I can’t believe it. Even at my youngest most unsophisticated I could never have wanted to make a Hopping John. But he’s been up there waiting for me. One pound dried black-eyed peas, 1/2 pound salt pork sliced, 1 teaspoon Tabasco….No I don’t think so. The Best of Kahlua has some stains on it and I can see why. Kahlua Chocolate Pralines, Black Russian Brownies, Kahlua Eggnog Pie. 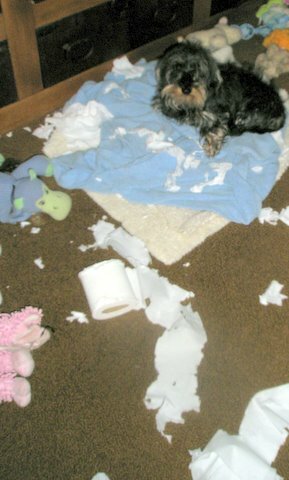 Yes, this one might have a second life with me. Rennie of course being a little dog can’t have chocolate — not that she hasn’t tried. "Well if I can't have chocolate a girl's got to have some fun!" 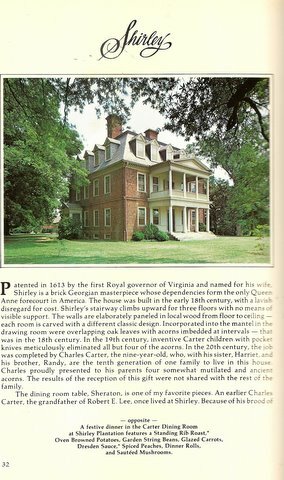 The James River Plantations Cookbook: A Glimpse Into the Homes and Kitchens of Old Virginia. Berkeley Pecan Pie served with Shirley Sauce: 1/2 pound butter, 10 tablespoons brown sugar, yolks of 2 eggs, 10 wineglasses of wine, 1 glass brandy. I think not. I like my guests able to carry on some sort of conversation with dessert not pass out from the sauce. Aunt Lucy’s Fat Pie is even worse for you than Shirley’s sauce. But the riverside homes are lovely. Shirley Plantation color photo: On the mahogany sideboard in the dining room of Shirley rests the silver saucepan in which the Wine Sauce always was made. A dusty little book The Big Spread – an Encylopedia of Hors d’oeuvres and Canapes by Ruth Chier Rosen. First page I turned to was Chopped Liver Pineapple. No I think I’ll pass. Thousand Island Dip? No. Bacon wrapped around Watermelon pickles. The Zodiac Diet Cook Book 1970. Okay I’m Scorpio. Scorpio – You are the most passionate of any othe zodiacal sign… Alright but what should I eat on my diet? Tomato Aspic. I thought that went out with dinosaurs. But in fairness looking back it was kind of good. 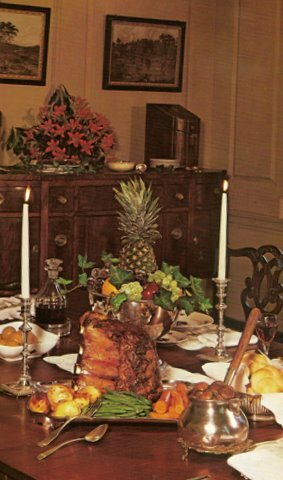 Wick and Lick – A Gazette of Chafing Dish Specialties; This was probably a necessity considering when I got married in 1956 Sterling silver chafing dishes were a gift of choice. I got nine of them and two copper. Well there’s a recipe for Cherries Jubilee. I do have three of the chafing dishes packed away somewhere. Maybe worth a try. Oh but last chapter is Menu for Safety and that cautions more than 1/3 of injuries from home accidents occur in the kitchen. One more thing good about Trader Joe’s pop ’em in the oven and heat as opposed to flaming in a chafing dish. Here’s one Cointreau – The Slow Glow: Well not so slow if they use Shirley’s Sauce proportions. 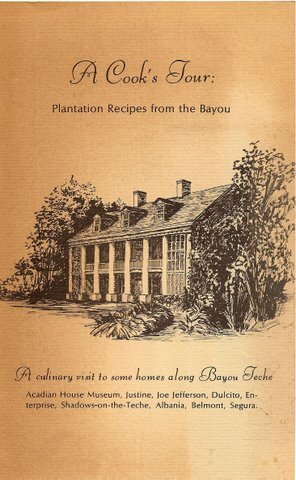 A collection of Choice Recipes by St. Jude Hospital Guild 1963-1964; Even a children’s hospital guild can’t get off the alcohol kick. Grasshoppers for Eight takes 1 quart vanilla ice cream, 1 cup green Creme de Menthe, 2 cups milk, 1 cup Vodka. But I have to admit I used to drink things like that long ago. Oh those late late nights when the night clubs on the Sunset Strip closed and we gathered at a small place on lower La Cienega to hear a wonderful young Afro-American pianist and singer name Bobby Short. We’d sit at the piano bar enraptured drinking things like Pink Squirrels. I get nauseaus even writing the name now. Now here’s one I’ll hang on to because there is a blog brewing about a trip I took long before Castro to Cuba with my parents. Cuna Del Daiquiri Cocktail – La Habana Cuba. You have to wait for that one. So does Ebay. How to Dress, Ship and Cook Wild Game 1945 Remington Arms Company Inc. Didn’t expect to find them in the cookbook business! It covers everything from opossum, raccoon, woodchuck to mountain sheep, caribou, moose and elk. EBay gets that one. 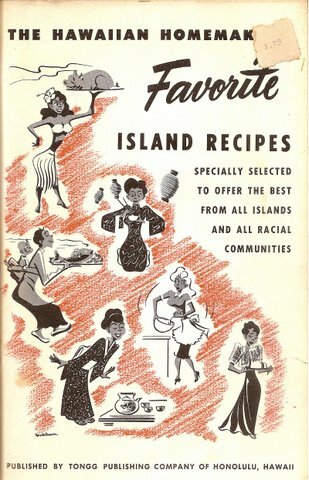 The Hawaiian Homemaker’s Favorite Island Recipes 1956. But what’s an Hawaiian recipe booklet without a recipe for Poi. They have a Poi Cocktail that calls for 4 cups milk, sugar, salt, nutmeg, vanilla, rum and 2/3 cup poi. But how do you make poi? I never liked it really but Hawaii without poi? Ebay.